Active on the music scene since the mid-Seventies, drummer/composer Patrick Forgas has often been regarded as the French answer to Robert Wyatt. Indeed, Forgas describes his discovery of Soft Machine’s second album, at the age of 18, as nothing short of life-changing. Anyone familiar with his debut album, Cocktail (originally released in 1977, and reissued by Musea Records in 2009 as an expanded edition) will not fail to notice the similarities in the two drummers’ vocal styles, as well as in terms of musical content. In spite of a career marked by frequent breaks from music-making, Forgas has always been able to reignite his creative spark. Forgas Band Phenomena was born in the late Nineties, and released two albums with a lineup that included mallet percussionist Mireille Bauer (of Gong fame). Then, after a 6-year hiatus, they reappeared in 2005 with a revamped configuration and a live album, Soleil 12, which featured mostly new material. The breakthrough for the band, however, came in 2009 with the release of the magnificent L’Axe du Fou, and their highly acclaimed performance at the 2010 edition of NEARfest. That career-defining show is captured on the DVD that accompanies Acte V, the band’s fifth album, released at the beginning of 2012 on Cuneiform Records. The album’s title, which at a superficial glance may seem self-explanatory, is illustrated in the liner notes with some intriguingly esoteric references that also expand on the origin of some of the track titles. Acte V features the same lineup as the band’s previous album – a rock-solid ensemble of 7 people, led by Patrick Forgas’ discreet but astonishingly precise drumming, bolstered by Kengo Mochizuki’s equally understated, reliable bass lines. With an instrumentation that includes violin, trumpet, flute and saxophone as well as the rock “basics” of bass, guitar, drums and keyboards, Forgas Band Phenomena produce an impressive volume of music that comes across as lush and tight at the same time, with a slightly repetitive yet heady quality that holds the listener’s interest. Karolina Mlodecka’s violin soars above the fray with lyrical abandon, often sparring with the forceful blare of the horns and the razor-sharp edge of Benjamin Violet’s guitar. Forgas’ handles the cymbals with a firm yet delicate touch, their metallic tinkle blending with Igor Brover’s sparkling electric piano to create one of the hallmarks of the band’s sound. As a whole, Acte V is a more nuanced effort than the ebullient L’Axe du Fou, and may need repeated listens before it starts growing on you. While the mood is definitely upbeat, alternating energetic bursts of sound with more stately, subdued passages, those shifts are effected with remarkable subtlety, rather than in the blatantly head-spinning fashion preferred by more overtly “technical” bands. The music flows elegantly and naturally, the horns conferring an appealing “big band” touch that is quite unique. In spite of the Canterbury comparisons, Forgas Band Phenomena’s powerful, exhilarating sound may bring to mind a cross between Caravan circa For Girls Grow Plump in the Night and early jazz-rock outfits such as Colosseum or Blood Sweat & Tears, rather than the sparser experimental approach of Soft Machine. Clocking in at a healthy 52 minutes, Acte V comprises 6 well-balanced, richly arranged tracks. Even if, at a superficial listen, they might sound rather alike, variety is achieved by contrasting the “choral” sections, in which all the instruments emote together, driving the melody along, with solo spots that never smack of self-indulgence. Opener “Corps et Âmes” allows Violet’s guitar to step into the limelight, imparting a piercingly clear rock tone offset by the airy lyricism of the violin and the full-on blasts of Dimitri Alexaline’s trumpet and Sébastien Trognon’s sax. “Loin d’Issy” hovers between a dynamic, upbeat mood and a gentler one, the almost mournful trumpet solo in the middle bringing to mind Ennio Morricone’s iconic soundtracks; while “George V” and “Ultraviolet” raise the rock stakes with blistering guitar combined with assertive horns and violin to produce an intensely exhilarating effect. Sax and violin interweave smoothly, though with a sharp edge that emerges towards the end, in the intricate “Feu Sacré”; then the album is brought to a close by the 13-minute “Midi-Minuit”, an ambitious orchestral piece that allows each of the instruments its time in the spotlight, displaying a slightly angular, jazzy allure at first, then unexpectedly introducing a different, more regular pace before the end, with hauntingly atmospheric effects. 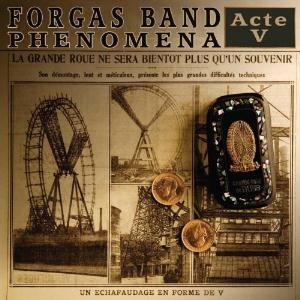 The DVD that completes the package (rounded off by a stunningly stylish cover in trendy sepia tones, reprising the Ferris wheel theme of Forgas Band Phenomena’s first three albums) offers a unique opportunity to witness the band’s blend of energy and sophistication coming alive on stage. The 75-minute set showcases a selection of compositions from the past (“Soleil 12”, “Extralucide”, “Eclipse”), the present (three out of four tracks from L’Axe du Fou, which had been released a few months before the show) and the future (“Ultraviolet” and “Feu Sacré”), as well as shots of the band. With outstanding image and sound quality, it is a must for anyone who wants to witness what, in my view, was the highlight of the whole event (together with Moraine’s breakthrough performance on the following day). All in all, Acte V is an album that oozes pure class from one of the finest bands on the modern progressive rock scene. This is one of those rare efforts that may actually succeed in bridging the ever-widening gap between the retro-oriented and the forward-looking components of the prog audience, appealing to both “factions” on account of the strength of its musical offer. A must-listen for jazz-rock fans and lovers of instrumental music, Acte V is highly recommended to everyone.